Forum administration User Groups is where administrators manage the grouping of users to more finely control what users can see and participate in the forums. A user group has a hierarchy of a category with a number of user groups inside that category. Should you have a site where all users can participate (whether that is public for any registered user or private with login/membership controls), you actually do not need to use this feature at all. If you are setting up private or special forums that will have limited users, it is a required step to first create a user group for the category of those forums as that will be needed in later steps when you set it up. An example is added when you install Asgaros for the first time with a category of Customer User Groups and a user group called Example User Group. You can either delete it if it is not needed or you can modify it to suit your needs. In this example, no users have been added to the group which will be shown further below. In this example, the title is Customer User Groups. Click + Add Category to add a category. Click Delete Category to remove the category. Note that if you have any user groups inside the category, those user groups will also be permanently deleted. Click Edit Category to change the name of the category. Click the link of the user group name to add users. This will bring you to the site’s Users administration screen where you can add new users. 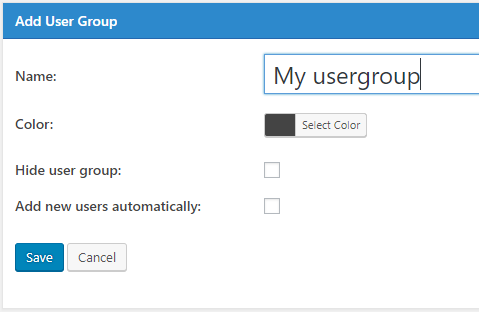 To actually add each new user to the group, after a user has been created, in each user’s administration screen scroll until you see where you can manage whether the person should be included (pick the box) or removed (unpick the box) from the user group. You can also use the bulk actions in the top-left area to add multiple users to a specific user group. Click +Add User Group to add a new user group in the category where it is clicked. The default color for a user group is black. Hide user group: Hidden usergroups will not be displayed inside the frontend. This option is perfect for internal user management. Add new users automatically: If this option is enabled, new registered users will be automatically added to this usergroup. Click Delete on the same line as a user group to delete it. Click Edit on the same line as a user group to edit its name and change its color. See the +Add User Group above as it has the same fields except the title being Edit User Group.